It's fair to say that Feel The Love was the summer anthem of 2012, accompanying more festival and sport montages than you could shake a pint of cider at. With its throbbing drum and bass beats, dubstep wobbles, horn calls and the soulful vocals of John Newman, Rudimental's breakthrough hit had more Hackney spirit than the Olympics could muster. Since then, the foursome have released Not Giving In (with vocals from Newman and Alex Clare) and, most recently, Waiting All Night with Ella Eyre. Undoubtedly these two tracks continue the raucous dynamic energy of Feel The Love, but they're in danger of becoming formulaic. Organ? Check. Soaring vocals? Check. Huge chorus? Check. The success of last year's hit has certainly been diminished. It's left to the rest of 'Home', Rudimental's debut album, to prove that they're more than a one-trick pony. Thankfully, it's more varied than the singles would suggest, mixing elements of dubstep, garage, soul and house. This is a dance album with mainstream appeal. Much of this variation comes from the numerous collaborations. 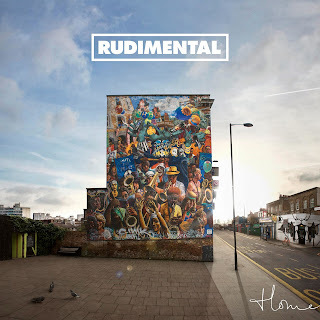 Where some artists simply bring their vocals to the trademark Rudimental sound, others bring their distinctive flavours. Fellow London producer MNEK (whose work includes the likes of A*M*E, Misha B and Little Mix) crops up on two tracks (Spoons and Baby), adding a touch of Disclosure-esque modern garage. And there's even room for New York rapper Angel Haze to spit out some rhymes on Hell Could Freeze. Some quieter tracks provide respite from the crash-bang of the singles, such as the slow dubstep of Hide, clattering ballad Powerless or pensieve album closer Free (featuring Emeli Sandé). Nothing is likely to catapult the foursome to the top of the charts as Feel The Love did, but their abilities as producers cannot be denied. At the least, the omnipotent Sandé has never sounded better. Listen: 'Home' is available from 29th April.